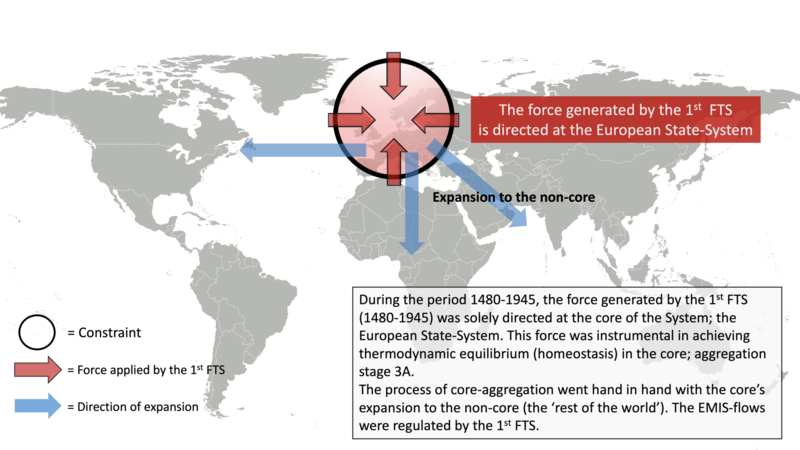 The upscaling of the (State-)System from a core/non-core to a globalized State-System, respectively regulated by the 1st and 2nd (global) FTA, was accompanied by a dramatic shift in the force that was applied in/on the (State-)System: Whereas the 1st FTS (1480-1945) applied a directed force at Europe – the 1st FTS was about achieving thermodynamic equilibrium in the core (Europe) – the 2nd global FTS (1945-…) applies a force at the global State-System, in order to achieve thermodynamic equilibrium at a global scale. 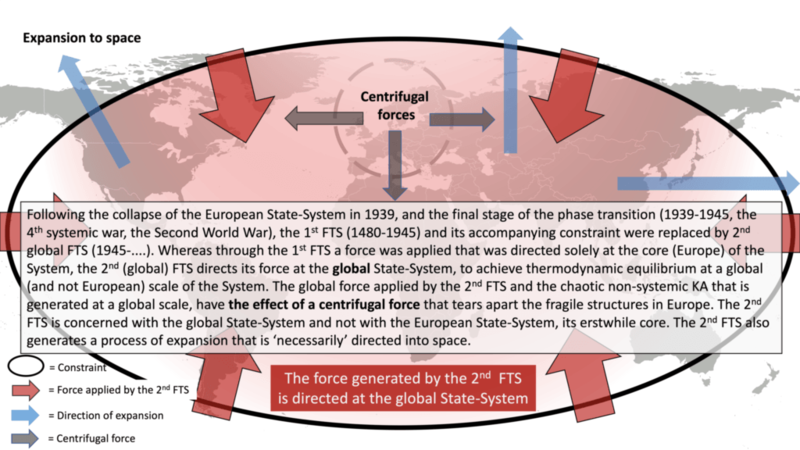 The 1st FTS applied a force to the European State-System (1480-1945). The 2nd FTS applies a force to the global State-System (1945-….). ﻿Source: On the Thermodynamics of War and Social Evolution. This global force has the effect of a centrifugal force on Europe – it tears the European Union apart, because fracture lines are amplified, and shared interest are not yet (sufficiently) institutionalized – while Europe is still in a precarious and vulnerable process of achieving full aggregation stage 3B. The centrifugal force also finds points of application at societal/state level and increasingly at community and individual level, through e.g. social media that allow for unrestrained information exchange, and the creation of (virtual) communities: The (accelerating) process of empowerment contributes to the detrimental effects of the global force that is now applied by the 2nd FTS.